NEW How to Pull Back 65% of Missing Clients Back into Your Salon … and DOUBLE Your Salon Income in the Process Using a Simple Ready-To-Go Salon Letter Marketing Kit! … You know that feeling when you walk down the street, outside your salon and you see a client coming towards you who’s hair you have been doing for the past ten years? You quickly realize and remember that you haven’t seen her in your salon for a while. Even worse, you notice she has been somewhere else for her haircut and color! She’s so embarrassed she looks down to the ground or stares blankly into a shop window while you go past despite the fact you have been her hairdresser, her freind, her confidant, her image maker for ten long years. I used to hate that feeling, doesn’t it feel weird after all those years looking after her in your salon? Why Did She Go To A New Salon? It could be she got bored with your hairdressing services. It could be you got bored with her hair and she knew it. It could be she got a voucher from another salon. It could simply be you’re no longer that special enough to keep her coming back for more. The reason really doesn’t matter but the impact on your hair and beauty salon could lead to a disaster. How often do clients go missing from your hair or beauty salon? How many clients go missing from your hairdressing salon each year? Why do they leave your salon? Will they come back to your hairdressing salon? And … How much are those clients worth to you in cash at the desk in your salon? Getting Them Back Into Your Salon Is As Easy as Doing a Conditioning Treatment Wearing a Blindfold! So just how easy would it be to get them back into your hair or beauty salon spending cash with you again? The answer to getting them back is a whole lot easier than you might be thinking. First let me go over a few numbers with you. So you can see the impact of just how much this issue will be affecting your salon on a daily, weekly, monthly basis! 200 clients in your salon a week. That means 30 clients a week you are slowly losing to other salons – NOT GOOD! But how much are those clients worth to your hairdressing business? Lets guess each client spends on average $60.00 each visit and they visit your salon 6 times a year. First lets add up the clients missing from lets say, your salon! 30 clients a week x 52 weeks = 1560 clients go missing every year! And do you know how much they are worth in real cash dollar numbers on paper? NINETY THREE THOUSAND and SIX HUNDRED DOLLARS Missing From YOUR Salon Takings! You can’t come off the salon floor. You can’t pay for a holiday. You can’t treat your kids or partner. You can’t treat yourself to a new iMac. You can’t go get the Gucci bag you keep promising yourself. $93,600 can even buy you a used Ferrari and a used Harley Davidson! Ignore those numbers and you’re on your way to going broke or a lifetime of struggle as a tired out salon owner searching to top up those clients that continually drop off! 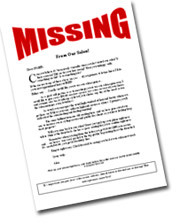 How Do You Get Back Your Missing Clients Fast? I’d like to show you the exact same, ridiculously simple strategy I used in my own hair salon marketing to increase my salon takings by a huge 65%. And, I managed to pull back MOST of my salon’s missing clients! Letters, a very simple set of proven to work salon missing client letters. So easy… it’s ridiculous. Step 1. Find or print out a list of missing clients. Step 2. Open the missing client, salon tested letters I have prepared for you. Step 3. Tweak them according to your salon. Step 4. Put a stamp on the envelope and put it in the mail box. All you do is wait for the telephone to ring. Before you know it you’ll start to see those missing clients coming back into your hairdressing salon. Is It Worth Chasing Missing Clients or Should You Focus on New Clients? The answer is really easy to understand. It will cost you seven times more to find a new client. What could you buy with that extra missing cash in your hairdressing or beauty salon? New furnishings for your home? Ask again … what would you do with the extra cash that has been bleeding away secretly from your salon? This simple system worked so well we ran it month after month after month, year after year until we had virtually all of the missing clients recovered back into the salon. You can download the very same, easy to follow system in the next 3 minutes. Here’s what I have created for you. A proven system of 3 letters written by myself, a premium copywriter (see www.OrangeBeetle.com) all designed and professionally written to pull in your missing clients very, very quickly! You can simply print them out and mail them with your details added. You can mail merge them with your salon computing system very easily. Either way these letters are on a easy to open word document and ready to use right now. You can have them seconds after download. The value in these pre-written letters is huge for you. The Salon Missing Client Guide & Blueprint. The guide is designed to help you truly understand what goes on in your clients mind and why they drop away from your salon. When you really understand this, you can personalize any of the letters for your exact salon circumstances. It also clearly explains the process of how to use your new missing client letters in very simple to follow terms. This is a simple, easy to copy and paste series of headlines that you can copy and paste into your new missing client letters. If It Sounds Easy, It’s Because It Is! NO salon can be afford to be without this and I’ll tell you why. 1. How can you afford to miss the opportunity to recover such a huge load of clients back into your salon. To ignore it is just financial madness. 2. If you told your accountant, financial manager or bank manager that you were ignoring this easy opportunity in your salon he would probably suggest you head for therapy right away. 3. I have never met anyone in business over the past 30 years that would turn down the chance to increase their business by 65%… have you? Ignoring this letter just makes zero sense from a salon owners perspective, I know you’ll agree! A 90 Day Salon Tested Guarantee? Why 90 days? It’s very simple. As a salon owner of 17 years and being involved in marketing for over 27 years I understand that taking action and seeing results takes time. After you download today, read the manual, make some tweaks if needed to the Missing Client Letters you can then start using them in your own salon marketing. You can have your Missing Client Kit on your PC in the next 60 seconds. You can recover literally hundreds of new missing clients fast. Remember … this is a NO RISK offer, you have 90 days to test like crazy! !